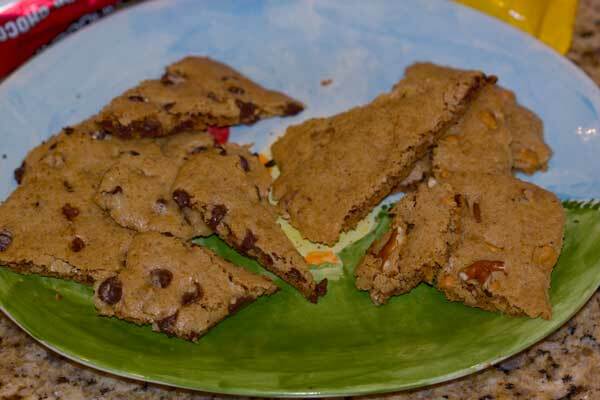 This recipe was inspired by a thin and crispy cookie sent to us by my friend, Nancy. I liked it so much I attempted making it at home, but the end result was thicker, so I called it “Brownie Bark“. When the bark was gone, I started in on an oatmeal peanut flavored version and named it “Monster Bark” since it’s basically Monster Cookies in bark from. And finally, when all the Monster Bark was gone, I created a new one. This cookie bark is made with wheat germ, butterscotch and/or chocolate chips, and mini pretzels. It might be my favorite of the three. I used an oatmeal, butterscotch and wheat germ cookie as a starter dough, but forgot the oats and ended up with a delicious finished product. Maybe a little too delicious. It’s hard to stop eating, and because it’s “bark” rather than uniformly portioned cookies, the only way you can judge a serving size is to put it on a scale. In other words, it’s exactly the opposite of the healthier portion controlled recipe I posted yesterday. Oops. At least it has wheat germ, and wheat germ is full the “happy” B Vitamins which may come in handy on dark, rainy, winter days. 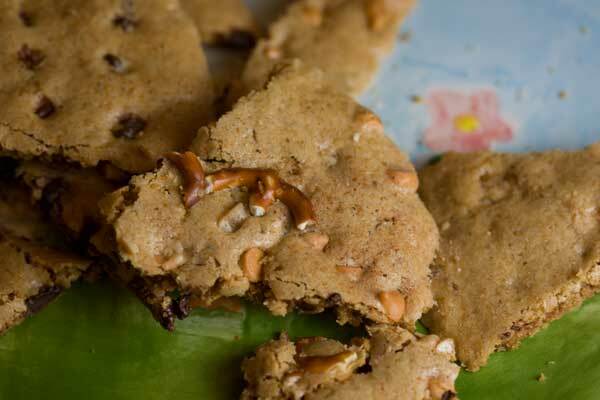 Thin cookie bark with butterscotch morsels or chocolate morsels, pecans and wheat germ. Preheat oven to 250 degrees F. Line two large (13x18) heavy duty rimmed baking sheets with nonstick foil. Parchment should be fine, too. With an electric mixer beat the butter until creamy. Add both sugars and continue beating until creamy. Beat in the vanilla. Add the egg and beat until mixture is lighter in color and fluffier (about 2 minutes). Beat in the salt and baking soda. By hand, stir in the flour. When flour is incorporated, stir in the wheat germ and pecans. At this point, you might want to divide the batter in half and add chocolate chips to one half and butterscotch chips to the other. Divide the dough into four sections. Starting with one baking sheet, press two sections of dough, side by side, as thinly as you can on the baking sheet. The point of doing it in two sections rather than one big one is to get more edge pieces. Repeat, pressing the other two dough sections side by side on the second sheet. If using the pretzels, break them into small pieces and press into dough. If you have time, bake one sheet at a time on middle rack. Otherwise, bake sheets on lower and middle rack, alternating halfway, for 45 minutes. Remove from oven and using a pizza cutter, cut into uneven triangles and such. Return to the oven and bake for another 15 minutes. Let cool at room temperature for about 10 minutes, then carefully transfer to to a wire rack and let cool completely. Bark should crisp as it cools. If you don't have a scale, be sure to stir your flour well before measuring. Also, I've only tested on the lower middle rack rather than the lowest rack in the oven. Baking on the lower rack *may* cause burnt bottoms, so unless you're willing to experiment, it might be best to make the bark one tray at a time. Or maybe I'm just being paranoid and the lower rack is fine. I made the bark last night and it came out really good. I used a mixture of walnuts and pecans, as I didn’t have enough of either. After I popped them in the oven (I did do two cookie sheets at once, one in top third, one in bottom third) I did happen to notice the crushed pretzels on my counter. I wish I had remembered those, as I do think they would have been a good addition. Nevertheless, the bark is delicious. Back again! Here’s the link to the Washington Post Chocolate Cookie Brittle. Now here’s the Brownie Bark. My guess is that the Washington Post version is crumblier and richer than my brownie bark which is harder and has some bite to it. The Washington Post version has lots of butter and no eggs. Based on how much butter there is, it’s probably richer than Sheila’s Brownie Brittle (the kind you buy at Costco) too. I’ll try it tomorrow. Mary, thanks for the tip on that recipe! I’ve never seen the one you mentioned. Mine is something I just made up using basic brownie batter, omitting egg yolks, using oil, increasing sugar, spreading thin and baking at a slow and low heat. I’m guessing it is a little crunchier and harder than the E.K. recipe, but I’m going to hunt it down and give it a try. I haven’t tried Brownie Brittle but something similar might be the chocolate cookie brittle recipe that was posted on the Washingon Post website a few years ago (you should still be able to search for, and find, it on the site). As best as I recall it’s an adaptation of an Eleanor Klivans recipe from her book ‘Big Fat Cookies’? When I make the recipe I use mini chocolate chips … and instead of spreading the batter/dough with a spatula, I roll it thin between two sheets of parchment (peel off the top sheet of parchment before baking). Like the recipe cautions, be sure to leave plenty of room along the edges of your cookie sheets because the dough spreads quite a bit! Wheat germ makes these healthy, right. The salty pretzel contrasting the cookie and chips really speaks to me! Maybe a little too loudly!! haha! Computer is acting up, but I left a message. Trying again. When I get off this baking hiatus and can bake all the yummy treats I want, I really want to make all these different cookie bark/brittles. When I’m back from my hiatus of baking all the yummy treats I want, I really want to try all these different cookie bark/brittles. Oh wow, that looks good! I have everything here to make the cookie bark recipe from The Daily Cookie, but I’m thinking I might have to make TWO batches of cookie bark this week. With the kids back to school, I know they would love this as a surprise in their lunches.